I recently picked up some vellum stickers of flowers. I had used some of the hydrangeas to create a background a few days ago and wanted to play with more of them. 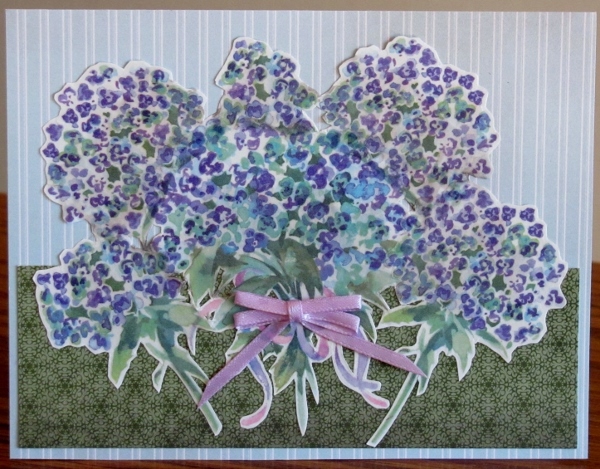 This time I layered six of them on plain white paper and fussy cut around the whole border. Then I used some warm grey Copic markers to shade those in the back tomake them recede. From a new paper pad I selected a greyed blue pinstripe and then a scrap of green for the background. The front bouquet had a violet ribbon printed on it so I tied an actual ribbon bow and glued that on over it. No sentiment was used as this allows the card to be used on any occasion. I picked up the fantastic set of 3D Susan Branch stickers (K & Company) the other day and wanted to use them right away. I created the backing for the Celebrate diecut with an embossing technique that I'll share tomorrow. I learned it in the online class I'm taking 'Creative JumpStart'. I arranged the stickers and embossed panel on shiny gold cardstock and rounded the corners. 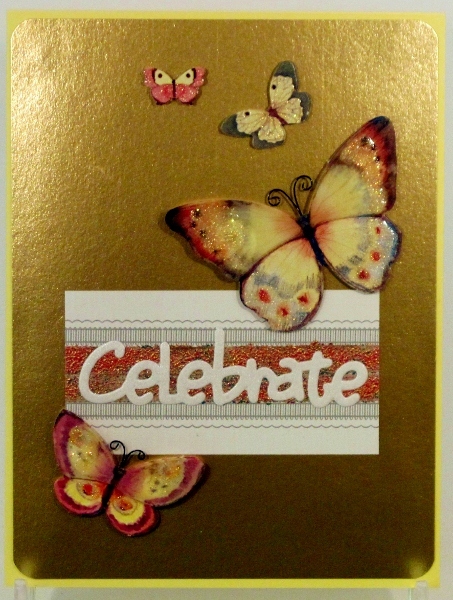 A yellow folded card base coordinates with the butterfly stickers. Here's another of the clear stickers of framed girls. I used only basic shapes (heart embossed background and striped paper) to continue the graphic look started with the tiny checks and dots in the sticker. I wrapped and tied red twine around the black strip and cut the text with a die. The blue from the sticker is echoed in the fine border showing from the folded card base. 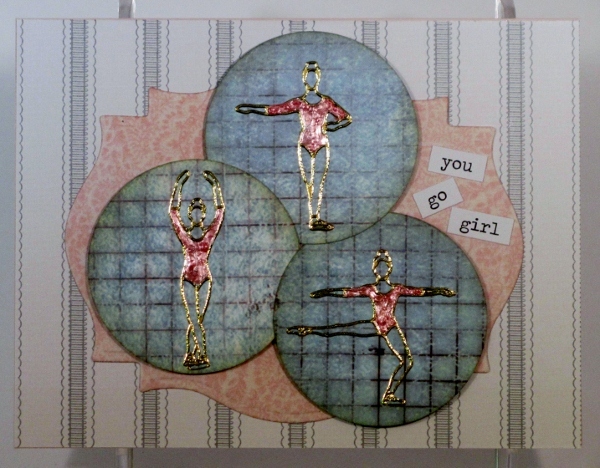 Today's card is a repeat of the ballet girl stickers. I gave this set pink distressed circles and overlapped them over striped paper. I cut off the right edge before mounting on a pink card base and then used a pearlized border sticker strip along it. 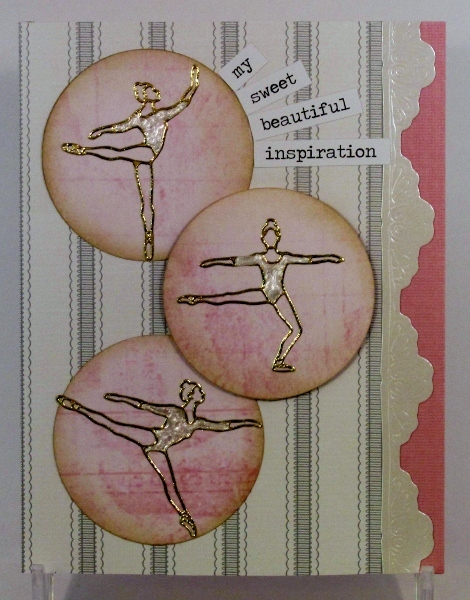 The leotards were, again, filled with Pearl Pen - white this time, and the text is created with Tim Holtz word stickers. I liked the outline stickers of ballet girls that I made last week and decided to use them again since I had more on the sheet. I wanted them to really be front and center so I mounted them each on a punched circle and distressed the edges before grouping them closely so the grid marks were all continuous between them. I popped the group on foam tape over a Spellbinders label shape and a striped paper. The lighting is not so good on this but you can see that I filled in the leotards with pink Pearl Pen. 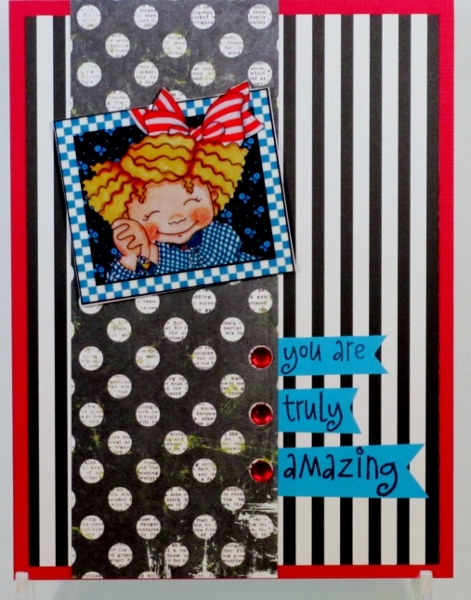 The text is created with word stickers from Tim Holtz. These little framed girls in clear stickers are so cute. They remind me of Mary Englebreit but they are not. I had pulled out the two black papers to use with this one and then had to find some way to pull the other colors into it. I went with a red border and red rhinestones to go with her hair bow. Then I created the flags by stamping individual parts of a phrase so they could be cut out separately. The only color not repeated is the yellow of her hair but I think that draws attention back to her. I used a stamp and black ink to create the caption at the top. I usually don't have a lot of use for 'baby' stickers but have some in my files anyway. I thought there might be some soldier who would want to send a card to a real little one at home so I pulled out this clear sticker. I put it on a patterned paper with a scrolled corner so he had a place to rest. I used my letter punches to create the phrase from the same paper as backs the side borders. To line up the letters I placed a strip of clear removable tape sticky side up on a grid mat. Then I used the grid to place the letters and then applied glue to the letters, flipped the tape over and lowered the letters to the card front. When the glue was dry I peeled off the removable tape. 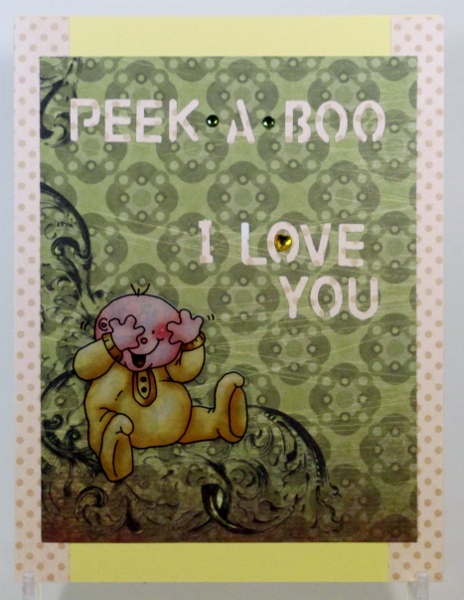 I used rhinestones for the dashes in 'peek-a-boo' and a heart rhinestone in the word 'love'. I like stickers that can be combined to create a logical scene. Such is the case with the sheet these little gym rats came from. I chose the one doing a headstand just for fun and then added the two bending ones to surround her. I used three patterned papers with colors from the bears and created a border underneath them with washi tape with a musical print. The text is a large holographic sticker. 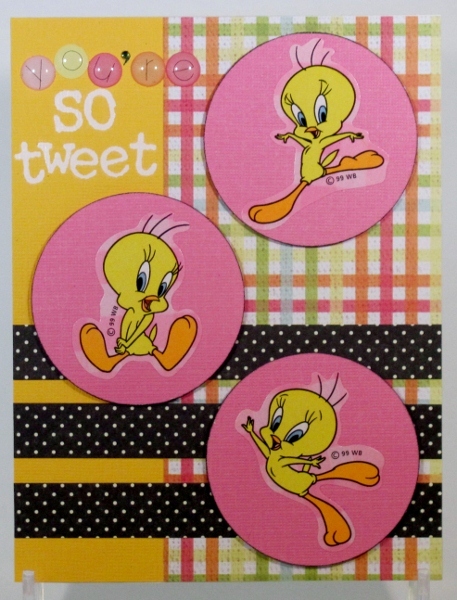 These 'Tweety' stickers came on a sheet with a pink plaid background. I cut pink circles for each of them and then created a setting for the using solid and patterned papers from the scrap bin. The three circles are all popped up on foam tape. The text is created with sticker dots and white rubons. The apostrophe is created with a small rhinestone with a tail of green marker. I chose the sticker for this card and built the colors of the card around it. I also wanted to emphasize the circle in the center by repeating dots in the papers selected. I also rounded two corners to follow the circle theme. I knew what phrase I wanted to put on this card but did not have it in stamp, stickers or rub-ons. 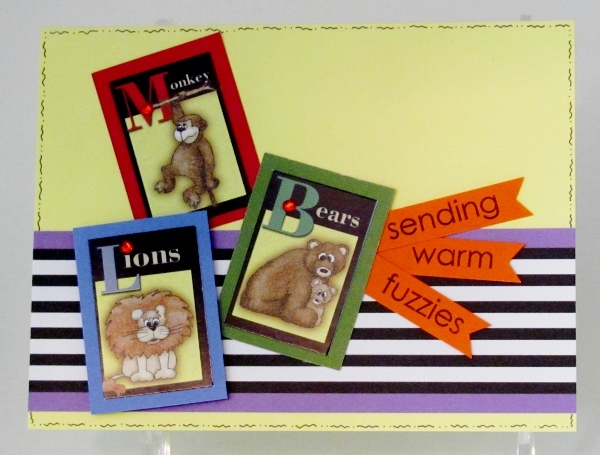 To get this look I used a cream cardstock and impressed the letters individually with a set of metal punches. I sponged blue over the letters but they didn't stand out enough so I went over them with white gel pen. Each word was cut out and then popped up on foam tape. The big circle is up on foam as well. I chose the sticker first and built all the colors around it - green, yellow, black and white. I used three graphic black and white papers to create the background design of the sketch and used a little yellow marker to color the center of the dots. Because the background was framed out in both colors I added the scalloped circle layer to include both colors there as well. 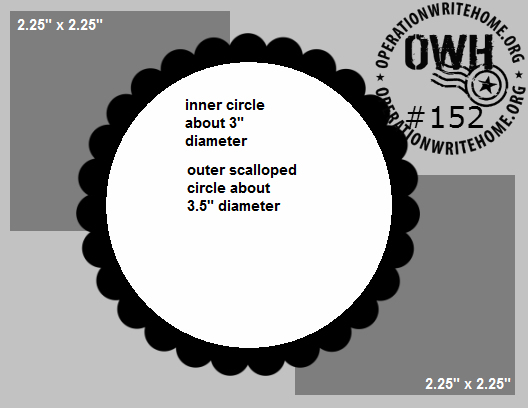 The graphic is a clear sticker and I popped up that whole circle element on foam tape. The text is stamped directly on the striped background. 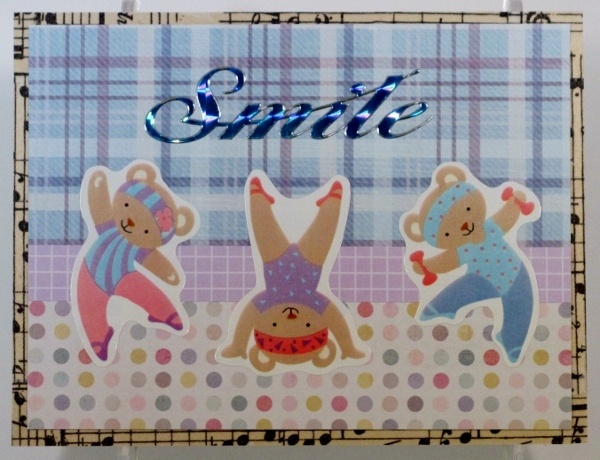 A full sheet of teddy bear stickers was mostly singles but there was this one grouping of three little bears. The sheet also included little heart stickers so I added two to the bear chests. I created a place for the bears to sit with a plaid carpet and a paneled wall. While I had that text mounted to the block in a swoosh for yesterday's card I stamped it again for this one and cut along the top and bottom to create a waving flag. The right end is up on foam tape while the left end is flush with the card. Little heart stickers from the sheet were added to frame the banner and the whole thing was mounted to a butterscotch card base. OK, I am officially in love with this card! I had a sheet of vellum stickers from the dollar store that were combined with little scriptures and blessings. However, I wanted to use multiple stickers and that made an odd mix of texts. So I stuck three of the stickers to a cream cardstock and cut out just the picture elements. I had already decided on the green diagonal stripe for the ground - including the torn edge top, So I went on a search for a blue for the sky. This plaid just called out to me! I ran it through my brand-new cloudy sky embossing folder and then used the sanding block to reveal the raised edges. 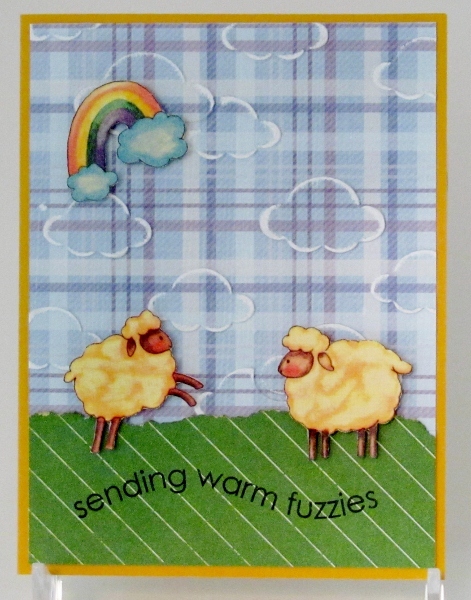 I added a butterscotch folded card base and popped the sheep and rainbow up on foam tape. I mounted the text stamp on the acrylic block in a swoosh before stamping directly on the grassy area. 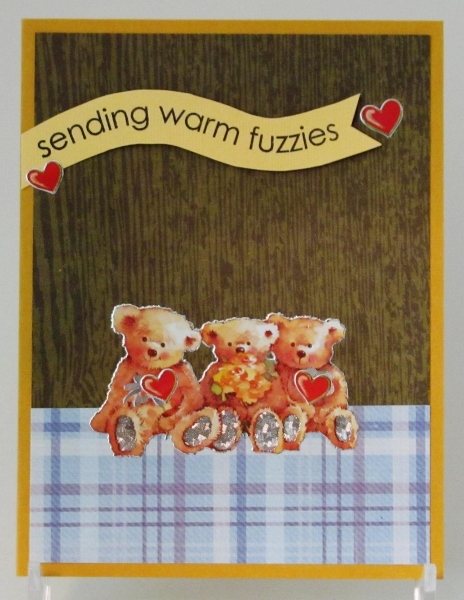 After yesterday's girly card I wanted to make one that was strictly for the boys. I had gotten some sheets of construction stickers at the dollar store several years ago. This inspired me to make a hill-climbing road for them to drive upon. I started with some green patterned cardstock to use as a mountain landscape. Then I cut three wedge-shaped road segments from a moss-green woodgrain paper. I drew edges on them with black Sharpie and arranged them in a zig-zag. 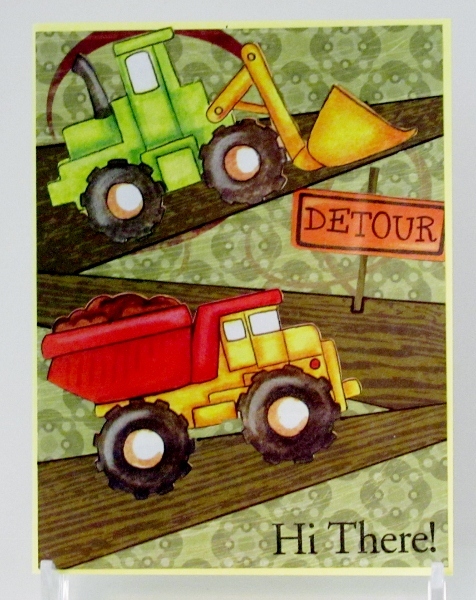 The loader and truck were added to their sections of the road and a signpost was created with a 'stick' and another sticker. This was all placed on a yellow card base. I stamped the text directly onto the background. (See the January 2 entry for my appologies on sticker-naming) I had half a sheet of peel-off ballet dancer stickers I wanted to use for the card today. I had the perfectly sized circle die so they would extend right to the edges and chose a mottled pink cardstock to cut them from. 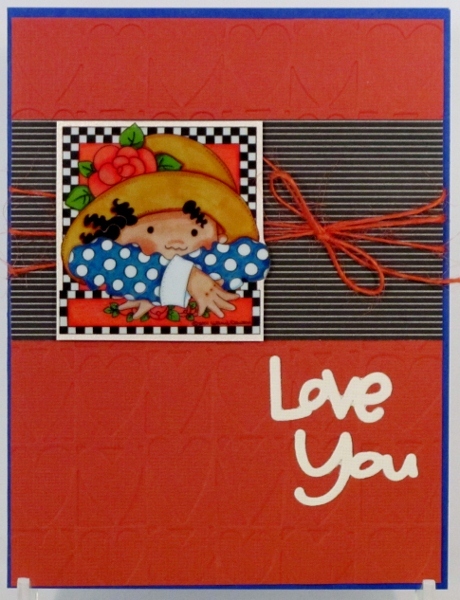 This card is all about creating a feminine but not fussy look - great for pre-teen and teen giving. I used black and white dots, a pastel blue with tiny pink + dn a small strip of script on cream. 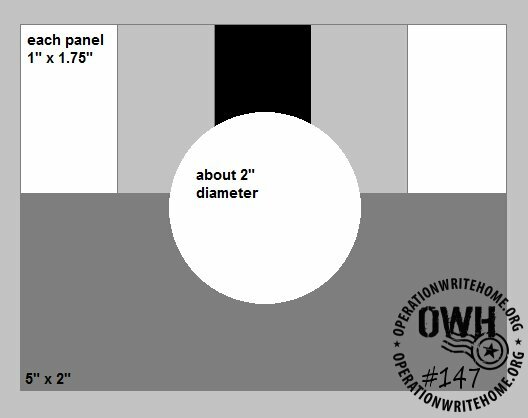 I rounded the corners to keep it softer and pupped up the three circles on foam tape in an asymetrical arrangement. This sticker set of baby items encased in tiny clear beads was mosty things like a rattle, a bottle, a pacifier, etc. This little teddy bear was the only one that wasn't reminiscent of a baby shower. 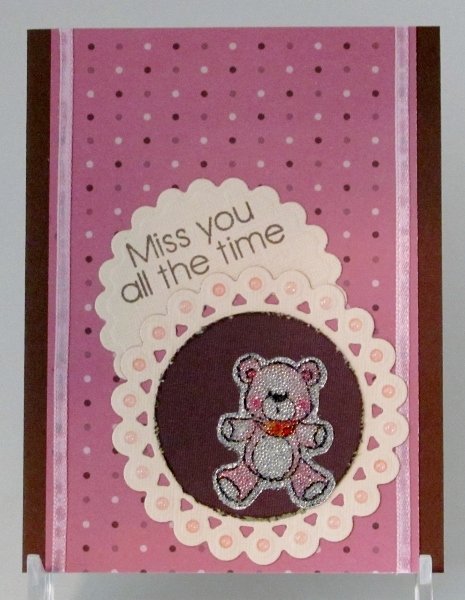 I chose the pink dotted background paper first and then added elements that coordinated with that and the bear. The bear got a dark chocolate circle with distressed edges and I cut a lacy scallop and plain scallop for backing it. I stamped the text in chocolate on the smaller scallop and tucked it behind the lacy scallop. The lacy one got pink dew drop stickers in every dot. 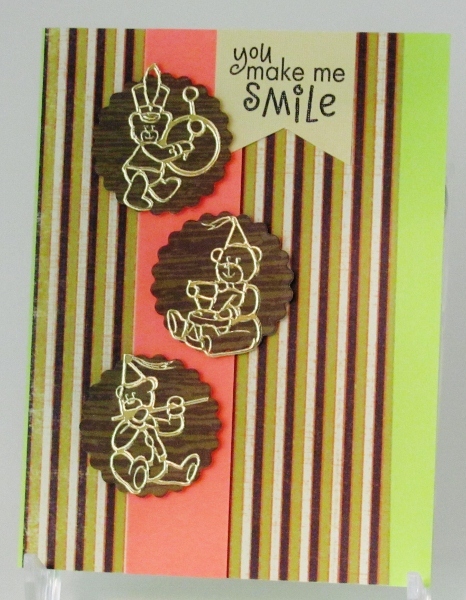 I bordered the sides of the background panel with narrow ribbon and added it all to a milk chocolate card base. I had Lions and Bears in this set of stickers but, alas, no Tigers. So I went with the Monkey instead. Each of these stickers was backed with a cardstock frame that matched the uppercase letter. 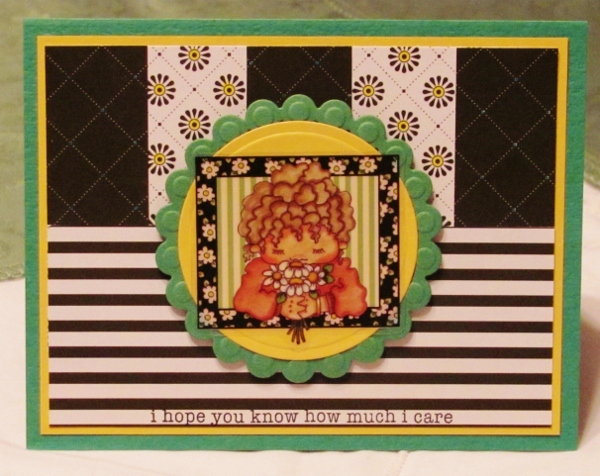 I used a light yellow folded card base that matched the background of the stickers. By now we were on the way to a crayon box of colors so I just kept going down that road. 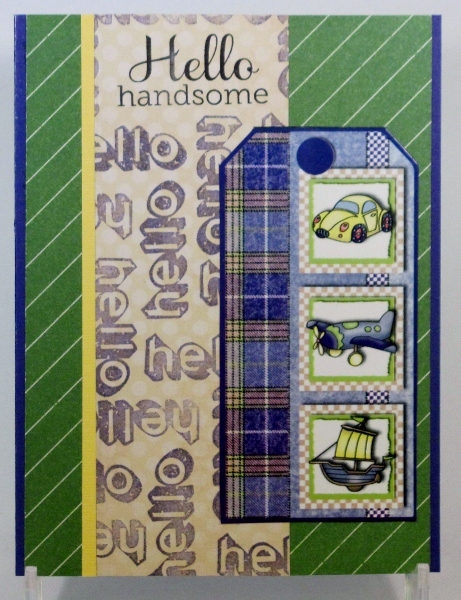 I liked the graphic character of the black and white stripe paper and added purple borders to the top and bottom. By now it was only lacking orange to use all the primary and secondary colors. I used that color to stamp the three words of a phrase stamp and cut into little flags. Each of the stickers got an orange rhinestone in the feature letter and I added doodle lines around the perimeter. Lastly, the Lion sticker was popped up on foam while the rest were glued directly to the face of the card. As with the rest of the recent kid cards I've been making, I started this with the sticker. Love this little clown cat! 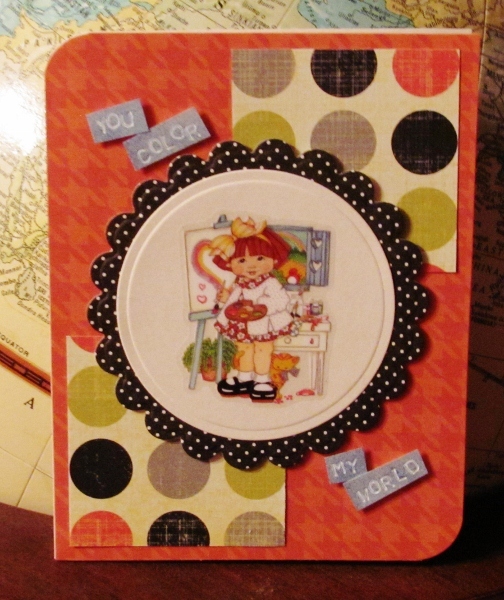 I cut a circle background for him along with a scalloped second layer. These were selected from the colors in the sticker, as were the card base and striped background. 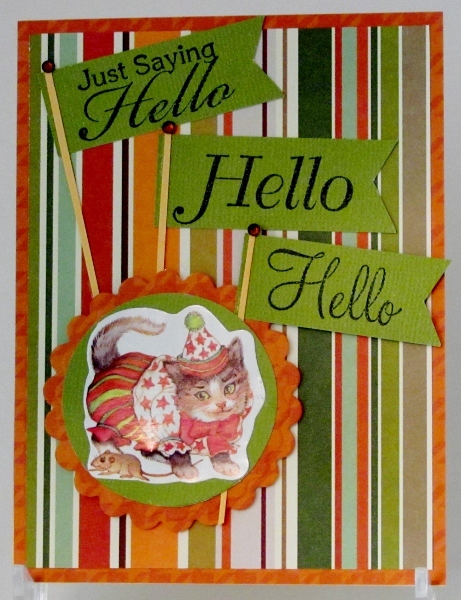 I stamped three versions of "hello" greetings on green and cut little flags around them. Each got a cardstock standard with a rhinestone finial. The cat module and the lower flag are mounted up on foam tape. Outline vinyl stickers like the ones I used today are produced by lots of companies. Since the first I ever used were called PeelOffs I tend to use that term generically regardless of the manufacturer. Most often I have cut the package apart and sorted parts of the sheet into category files for use. Sometimes the sheets were given to me in a swap and I don't know who made them. My appologies to all those who make the stickers I use and blythely call by the name of a competitor's brand. That aside, I had a half sheet of some gold outline bears playing instruments and wearing party hats. I cut a scalloped circle for each of them. To keep up the party atmosphere I pulled out some brightly striped cardstock and added a bright folded card base and feature strip with colors from that striped paper. A cardstock flag was stamped with text before mounting and each of the bears got a foam tape to pop them up from the background.